Neurolearning Blog: Multi-Tasking Dumbs Us Down for Some Jobs, But Could It Provide Breakthroughs for Others? Multi-Tasking Dumbs Us Down for Some Jobs, But Could It Provide Breakthroughs for Others? "They're suckers for irrelevancy," said communication Professor Clifford Nass... "Everything distracts them." Because many in your acquaintance (or even household) may proudly tout their media multi-tasking ability, researchers thought for sure they could identify the cognitive gifts that come with this ability. Researchers at Stanford searched high and low for this gift, but their final conclusion - it's not a gift at all, but a liability. "We kept looking for what they're better at, and we didn't find it," said Ophir, the study's lead author and a researcher in Stanford's Communication Between Humans and Interactive Media Lab. Now by true multi-tasking, we don't really mean semi-automatic activities like listening to familiar pleasant music, walking, or driving a car. These tasks don't require a lot conscious higher cortical brain work, like say reading and responding to an email or answering questions when a colleague or classmate calls you to find out what was missed in an important meeting. 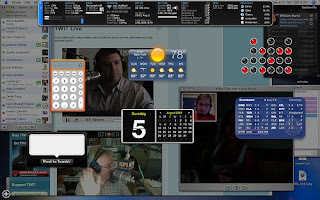 At left look how poorly high media multi-taskers did compared to low media multi-taskers on a distraction task. 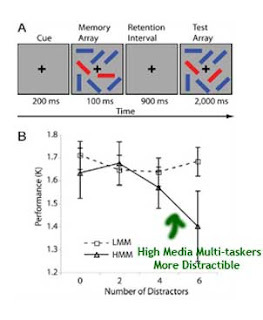 Not only were the high media multi-taskers more distractible, but they also performed lower on memory tests and ability to task-switch. A few years ago, a Hewlett-Packard sponsored study suggested that the IQs of knowledge workers distracted by emails and phone calls dropped their IQs about 10 points, and a Microsoft study found that on average, workers who stopped their activities to read emails needed on average about 24 minutes to return to their tasks. All this seems very reasonable, but some of crazy media multi-tasking that many of us in think-heavy careers might do is not the same as the tasks given in these paradigms. The Poincare examples comes to mind. Henri Poincare (mathematician extraordinaire) has written that whenever he wanted to think deeply about a problem that remained unsolved, he would put it away and then work simple derivations in an absent-minded way. Often when he was at work with such 'mindless' activities, a new possible solution would come to him and he would return to the problem and find he had had a breakthrough. The increase susceptibilty of media multi-taskers to peripheral distractions is not a surprise if you consider the research about diffuse attention and creativity,but I can't help thinking that the learning and task-switching results might arrive at different conclusions had the nature of the focus and distractor task been very different, especially if the focus task required more insight-based problem solving than a demanding problem solving task that require several very consciously-solved steps. The ideal distractor, it would seem, should be familiar and not overwhelmingly pleasurable...an activity that perhaps could shift the brain into a pleasant 'default rest' or daydreaming state. Kind of like Einstein playing his violin for a while to come up with new ideas for solving difficult problems. Anyway, something to think about before management gets the bright idea about doing away with email checking or games at work for high-level knowledge workers, It's not by accident that many of the most successful creative companies embrace a good deal of play and distraction at work.